About - Barossa Valley Cider Co.
Barossa Cider Co is us, Oscar and Hugo Bowen, brothers-in-arms. Born and bred in the mighty Barossa Valley, and growing up amongst the vines surrounding our family property, it always seemed the logical thing to naturally follow in the footsteps of our family wine folk and do what’s always been done around here. You know the sort of thing: carry on the tradition, build on the generations that came before, create a dynasty, and eventually rule the world,… we’d be crazy not to, right? But, that would’ve been following, not leading. That would’ve been writing our old folks story, not ours. And besides, we always had grander plans. We wanted to blaze our own trail of discovery and inspiration. There’s a saying: ‘The apple never falls far from the tree’. And that may well be true, it’s just that in our case a couple of apples (and pears) fell off and rolled a bit… and kept on rolling, all the way down the valley and up the hills to some of the finest, purest apple and pear orchards in the country. We wanted to be pioneers… so, we’ve created the best craft ciders possible and we’re taking them to the world. 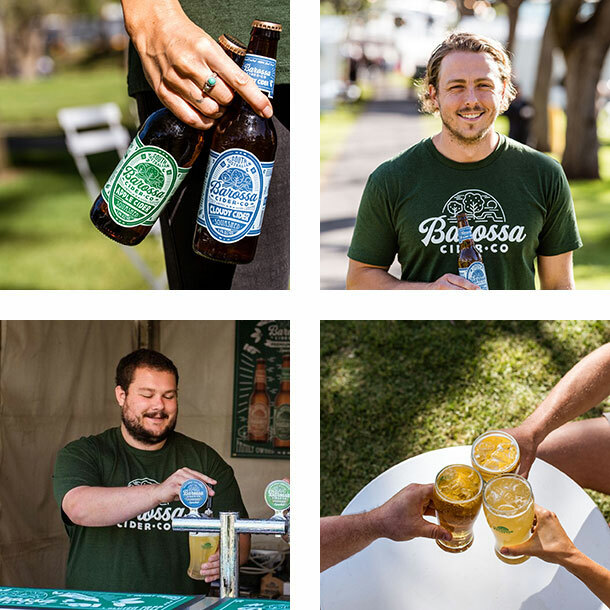 Barossa Cider Co is us. And, it’s also about you. Sure, we think it’s about the best cider on the planet, but, it’s also about taking a chance, writing your own story and just… going for it! And if truth be known, we’re pretty chuffed we’ve finally put the Barossa on the map.